This last month we have experienced both a series of severe thunderstorms and the annual big bang of New Year celebrations. Normally we humans take these events in our stride but very often our dogs do not and become extremely fearful and even panic when they hear or feel a thunderstorm approaching or the whoosh and bang of firecrackers. We are sometimes told not to give our fearful dog any attention or sympathy or we will be rewarding the fearful behaviour and in so doing cause the dog to become more fearful. But ignoring the dog under these conditions does not help the dog at all. We can only increase behaviour by rewarding it if there is rational thought involved. 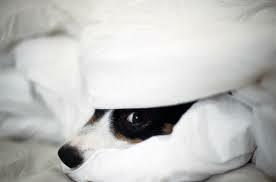 If a dog is in a state of fear he might shiver or tremble, hide, pant and drool. He might tuck his tail and might show the whites of his eyes. He might also panic and try and get away from the loud noise or the thunderstorm by running away. These are all symptoms of fear or anxiety and are the body’s instinctive response to a feared stimulus. When the dog is in this state of fear he is in pure reaction mode, incapable of rational thought. Learning can only take place if the dog is not in a state of fear. In other words, is capable of rational thought. Learning is the process whereby we increase the frequency and intensity of behaviour by providing a consequence that is rewarding. But if I console and pet my fearful dog during a thunderstorm my goal is to replace the anxiety or distress with that of being calmer not to teach it to be more anxious or distressed. My objective is to change the emotion, not the behaviour. If petting and consoling my dog was rewarding the fear then the fearful behaviour should increase in frequency and intensity. The panting and drooling should actually get worse. In fact, within five or ten minutes and with the storm raging outside, my previously frantic dog falls asleep. Not all dogs respond this way to physical contact during a storm or fireworks but there are other ways to counter-condition the fearful response. Some dogs calm down more if given a safe, dark corner or cupboard to hide in, surrounded by favourite toys. Playing music or the radio also helps to mute the sound of the thunder. Closing curtains blocks out the flashes of lightning. These are such simple, uncomplicated ways to keep your dogs safe. And if a little more attention was paid to their welfare the various rescue organisations would not be inundated at this time of the year with traumatised and damaged animals.